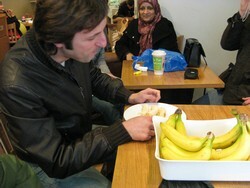 Muslim Aid’s coffee shop The Fair Factory hosted its first ever banana eating competition on Saturday 7th March, as Fairtrade Fortnight drew to a close. Members of the public rose to the challenge as the competition heated up. The world record currently stands at 5 bananas eaten in 1 minute. 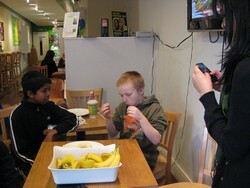 Ten year old Kamran (pictured left), one of our youngest contenders, took the lead when he ate 4 bananas in 1 minute. At one point Kamran consumed a whole banana in 10 seconds! Muslim Aid’s coffee shop The Fair Factory and The Wild Cherry Restaurant, next door to the Buddhist Centre, went ‘bananatastic’ as part of Fairtrade Fortnight from 23rd Febuary until 8th March which aims to raise awareness of small farmers and workers in developing countries who rely on the Fairtrade price to earn a sustainable living and improve their communities. 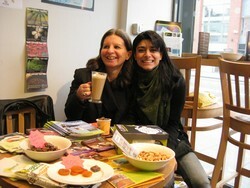 Thank you to everyone who wondered into the Fair Factory to engage in a bit fun for a serious issue!